„Ah, hard to encounter, even in many lifetimes, is the decisive cause of birth in the Pure Land, Amida’s universal Vow; and hard to realize, even in myriads of kalpas, is pure shinjin (faith) that is true and real. If you should come to realize shinjin, rejoice at the conditions from the distant past that have brought it about". „Although we feel the weight of the Buddha’s compassionate benevolence, it is indeed difficult to repay it." It is difficult to repay Amida’s benevolence, that is, to respond in gratitude to His virtues. As Shinran said, even if the virtues of Amida would be praised „for a hundred thousand kotis of nayutas of kalpas, by tongues a hundred thousand countless kotis of nayutas in number, each tongue producing countless voices, still those virtues could not be exhausted." Is truly to repay the Buddha’s benevolence." „ 'What is 'great compassion'? Those who in their turn encourage others to practice the Nembutsu are called those who practice great compassion.'" Throughout all the ten quarters". 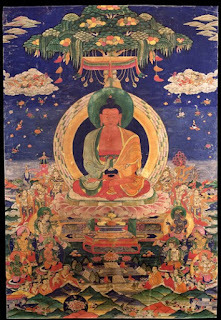 To „spread the two aspects of Amida's directing of virtue” means to convince people of the truth that Amida can save them by bringing them to His Pure Land where they attain Buddhahood/perfect Enlightenment (the first aspect of Amida’s directing of virtue) and that once they become Buddhas in the Pure Land they are able to return in various samsaric realms to guide others to the Pure Land (the second aspect of Amida’s directing of virtue). Know that such an encounter is rare, even in a myriad kalpas. In a thousand lifetimes, a person might encounter the Vow but once. From this day to the very end of time, wherever you are, give praise to the Vow, and wherever you may go, encourage others to hear it." "It is the most difficult of difficulties for one to believe in the teaching of Nembutsu and make others believe it, too. To transmit the great Compassion of Amida Buddha to others and to spread His teachings far and wide is the true repayment of the benevolence of Amida Buddha." By receiving shinjin (faith) we become part of the salvation work of Amida Buddha, a link in His chain of Great Compassion. As people of faith, we can naturaly influence others towards faith if they are open enough, or at least we can help them make a little connection with Amida. Every person, human or non-human, who knows somebody who has genuine faith in Amida can somehow make a little step further towards Amida. Not all those who have faith become teachers or priests, but this doesn’t mean they can’t be living examples of faithful devotees. Also, people of faith can do various activities in the benefit of Amida Dharma by sharing texts related with Amida, supporting true teachers and temples, etc. Any of the actions mentioned in this article are a natural manifestation of the need to repay the benevolence of Amida Buddha and are the way we practice great compassion in this life.